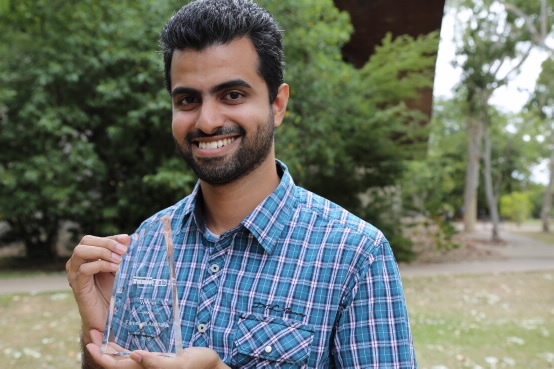 James Cook University’s Dr Sandip Kamath has been named the Australian national winner of FameLab 2015. Dr Kamath with his trophy after winning the national final FameLab 2015. Famelab is run by the British Council in Australia and involves academics presenting their work on stage in an engaging and entertaining manner. Dr Kamath is part of a team of the Molecular Immunology Group, in the Centre for Biodiscovery & Molecular Development of Therapeutics (CBMDT). The team has been granted more than $21,000 by the North Queensland Children’s Research Foundation and the Australian Institute of Tropical Health and Medicine (AITHM) for a study seeking to isolate the 20 most common allergens found in North Queensland. Dr Kamath won a heat and a state final in Brisbane before travelling to Fremantle to compete against other state champions in the national final. Dr Kamath is now preparing to represent Australia in the international FameLab finals at the Cheltenham Science Festival in the UK on 3-4 June. His victory in the competition follows that of last year’s national champion Dr Michael Smout, another staff member from JCU.